The Isaac by Plank & Hide is a unique rendition of the traditional shuffleboard table. 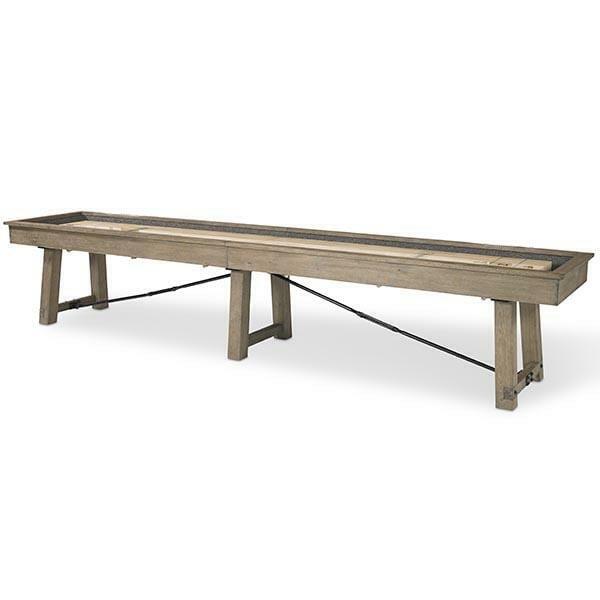 This striking game table is constructed of solid oak and features a rustic Silvered Oak finish. It is highlighted by a steel turnbuckle, solid one piece angled legs and finger-jointed rails. There is a center leg that offers additional support and, along with the climatic adjusters, ensures a level playing field. This top seller is 3” thick and is 20” making it a regulation size table. It features a polymer surface finish in a liberal ¼” thickness which guarantees an effortless glide. It is available in two lengths, 12’ and 14’ and the cabinet can be broken down into two pieces to make for easy transport and installation.